If you remember the post I made a few weeks ago, I wrote an explanation on a scary story dealing with a Haunted Majora’s Mask cartridge. In the first part of the article I assumed the haunting was real and explained the phenomenon using my knowledge of Computer Science to provide each specific occurrence with a logical explanation. I then finished the article by explaining that it was probably fake or hacked. Today, I got a reply from the author of Creepy Pasta. In the email the author gave me a link the original site. The site “You Shouldn’t Have Done That” contains the original story and videos of the Haunted Majora’s Mask game. Along with all that, it also contains an apology. There the author explains that the Haunted Majora’s Mask game was a story that he made up; he wanted to create a story that internet readers could relate to. The author noticed that many scary stories are read with a feeling of safety. The reader doesn’t really get into the story because they’re reading it through a computer screen. The author created BEN as a way to give readers a more frightening experience and break through that feeling of safety. 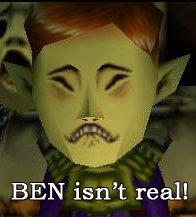 He chose to use Majora’s Mask because it already had a creepy feel to it, and it was well known. Readers could easily relate to the game, and any story related to the game. To his luck, many readers really got into the story and felt it was real. Many of the comments to my previous post were from readers who truly believed it was real. The author is very sorry for tricking those readers, and you can read the full apology here. The author wished he could continue the story, but due to his college budget, he was unable to. However, he plans to write more stories. If you liked the Haunted Majora’s Mask game, you can read more stories by the same author at “You Shouldn’t Have Done That”. My final conclusion in part 1 was right, the story was fake, but it was still fun to read. There exists a lot of scary stories out there that are made up but still interesting. After all, entertainment industries like Hollywood wouldn’t have any horror movies if they were only allowed to use real stories. I’m curious, for those of you who thought it was real, how do you feel now? Does this give you any relief? And for those of you who thought it was a hoax, what do you think? Did you like the story and enjoyed it, or are you mad that he made it up for entertainment? Tell us in the comments!